We're waging an increasingly desperate war on drug-resistant bacteria. Thanks to their adaptability--and our own fondness for strewing antibiotics everywhere, like inept military commanders who let the enemy borrow and examine our only weapons before we attack--the bugs are gaining ground. Previously life-saving drugs are now useless, and previously beatable infections now have strains that seem immortal. To find new antibiotics that can help us, why not turn to animals that are still doing a good job keeping harmful bacteria at bay? In a recent study published in PLoS ONE, Australian researchers turned to two such animals. The first was the tammar wallaby. A kangaroo relative, the wallaby gives birth to bean-sized young that live in a pouch until able to survive on their own. (You can see a joey's face sticking out in the picture above.) The other animal chosen for study was the platypus, a mammal that's famous for laying eggs and looking like someone's idea of a joke. The researchers picked these animals for a few reasons. Most practically, their genomes had recently been sequenced. They're biologically interesting because they represent our most distant mammal relatives: Their two lineages, the marsupials and the monotremes, diverged before the rest of us mammals had settled on placentas and live birth as the best way to make babies. 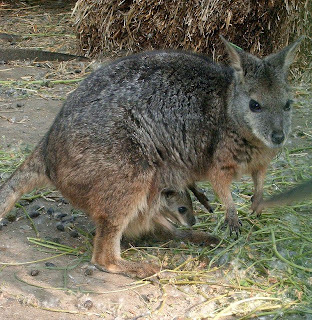 The wallaby delivers its young after just 26 days in the womb, after which the baby stays in the pouch for 9 or 10 months, drinking milk from its mother's teat. Young platypuses hatch from their eggs in a similarly underdeveloped state, then stay in a burrow for a few months while they drink milk that leaks straight out of their mothers' skin. What's most relevant about the platypus and wallaby is that their young, coming into the world at such a vulnerable stage, must be extremely well protected from infection--whether that protection comes from agents in their own bodies, their pouches, or their mothers' milk. The researchers combed through the two animals' genomes to look for antimicrobial proteins called cathelicidins. Humans make just one kind of cathelicidin, but these proteins have been found in a wide range of animals and can destroy bacteria, fungi and protozoa. In keeping with the hypothesis that marsupials and monotremes need to have a lot of protections in place for developing young, the researchers found eight cathelicidin genes in the platypus and 14 in the tammar wallaby. In the tammar, these genes were active in the mammary glands during lactation, and in the skin of young living in the pouch. But why sit around and speculate about how effective these antimicrobial proteins are? The researchers picked two cathelicidin genes from the wallaby and two from the platypus, then manufactured some of the actual proteins they coded for. Then they tested these proteins against a host of bacteria. If bacteria had blood, it would have been a bloodbath. The wallaby and platypus proteins killed B. subtilus, staph (S. aureus), two kinds of strep (S. uberis and S. pyogenes), E. coli, Salmonella choleraesuis, Pseudomonas aeruginosa, and the fungus C. albicans, which causes yeast infections. The four proteins were all more powerful than the human cathelicidin. One wallaby protein, in particular, was up to 80 times more effective than its human version against the various microbes. Against E. coli and B. subtilis, it was 10 times more effective than commercial antibiotics such as ampicillin or tetracycline. When the researchers put this wallaby protein back in the ring with multidrug-resistant bacteria, it killed A. baumannii, K. pneumoniae, and a bacterium called P. aeruginosa that can resist even last-ditch antibiotics. Our ancient mammal ancestors may have naturally produced a greater number of antibiotics, like the tammar wallaby and platypus do, to protect themselves and their vulnerable young from infections. Over time, the placental mammals seem to have lost those genes, giving up antimicrobial abilities while keeping our young protected in our bodies for longer. But with the threat of drug-resistant bacteria, we've become vulnerable again. To develop new lifesaving drugs, we may have to enlist the help of distant relatives that followed a different evolutionary path. Photos: tammar wallaby and joey Wikimedia/Mathae; platypus genome.gov. 1) If we start using these wallaby and platypus proteins, will all of the current bacterium eventually grow immune to those proteins? 1a) If so, will I still be alive by the time this happens -- assuming I avoid all the terminal diseases and horrible accidents I could happen upon? 2) Why have the bacterium not grown immune to the proteins of these animals the way they are developing immunity to our antibiotics? OK, most important question first: (3) I checked two dictionaries, and one only had "platypuses" as the plural. The older dictionary had "platypuses" first and "platypi" second. 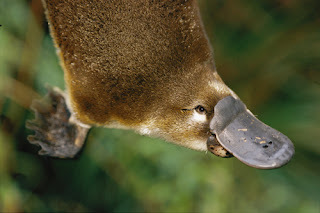 The word was invented around 1800, when English-speaking people discovered platypuses/platypi, so it's fake Latin anyway. (1) We've had to keep making new antibiotics ever since we started making them, because bacteria do tend to catch on. So if we started making, say, wallaby-cillin, some bacteria could eventually become resistant to it. (2) I would guess that antibiotics in animals' bodies have to keep evolving, just like man-made antibiotics do, to keep up with evolving bacteria.